Item #: CSC11880PBLW1. 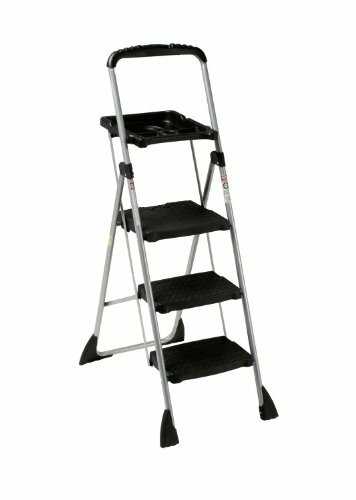 Lightweight yet durable steel step stool features three heavy-duty polypropylene resin steps with slip-resistant treads; large 14 3/4w x 12d top platform step. Handy molded utility tray holds tools, paint cans, wallpaper rolls, etc. Extended hand-grip handle with tool holder. Non-marring, skid-resistant feet provide stability and protect floor surfaces. Easy one-hand fold and lock release.